Normally heat is being continuously produced in the human body, and also is being lost continuously to the surrounding environment. 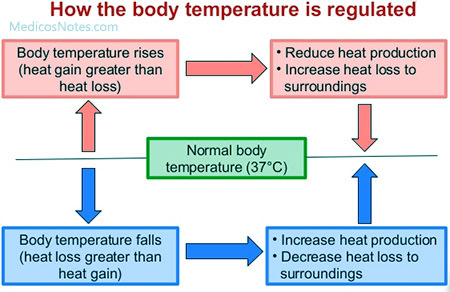 The person is said to be in heat balance when the rate of heat production is equal to the rate of heat loss,But when there is a disturbance of equilibrium between the production and heat loss, then the body temperature may rise leading to fever, or temperature may fall leading to hypothermia. What are the factors that determine the rate of heat? Effect of epinephrine and norepinephrine. Radiation: Loss of heat can occur from the body in the form of infrared rays. Conduction: Heat is conducted from the body to the objects that comes in contact with it, e.g. chair, bed, etc. Convection: Heat is lost from the body by the air currents surrounding it. Evaporation: Evaporation of water (sweat) from the body surface serves as a very important protective mechanism in decreasing the body temperature which may rise due to environmental factors (that is in hot weather). In heat stroke, the sweating is impaired hence the body core temperature rises to dangerous levels.